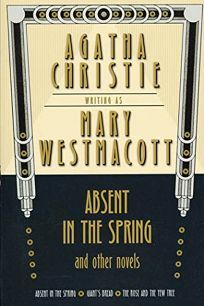 For those truly unable to get enough of the perennial queen of mystery, St. Martin's has reissued Absent in the Spring, a collection of three novels by Agatha Christie writing under the pen name Mary Westmacott. The clipped prose and careful plotting are familiar, but daggers and blunt objects are replaced in this trio of psychological dramas by sofa cushions and tea sets. The title novel tells of a middle-class man haunted by a past liaison; Giant's Bread of a composer and pianist obsessed with art; and The Rose and the Yew Tree of a young woman tormented by love.